I posted about, and followed, the “Danish method” of interval training a number of years ago. The basic principle was given to me by Tim Male (coach, lwt erg British record holder, ex-international rower) as double the target distance, and roughly 1:1 work to rest ratio. I used this rough formula to slightly adapt the 5k Pete Plan sessions to move from a 6k total session distance to 7.5k, and increase the rest intervals between the reps slightly from flat 1min rests to 1min30 per 500m. 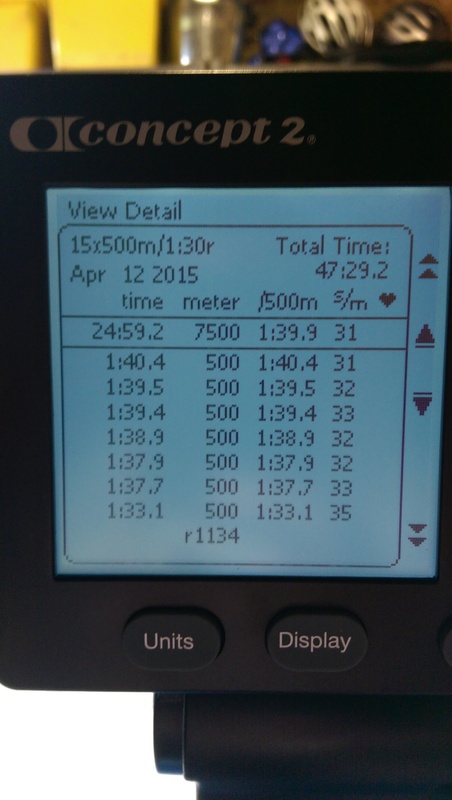 The first session in the progression is therefore 15 x 500m / 90sec rest. As with the 5k sessions I like to use these progressions to acclimatise to a target 5k pace rather than necessarily being a flat out reps sessions. So rather than aim to go as fast as possible across all reps, at whatever stroke rate gives me the best possible pace, instead I take a target 5k pace and work up the progressions week on week aiming to hit the same target. So I have set a target 5k of 16:59, giving a target pace of 1:41.9. The idea is then week on week to decrease the number of reps that the 7500m is split into (ie increase the length of the reps) and keep to the target pace of 1:41.9. The one caveat I give to this pacing though, which I have told to a number of people I coach over the years, is if you get to half way through a session like this and are completely confident you can go quicker then its ok to negative split from there. This is especially true on a session with this many reps, as after 8 reps you’ve acclimatised nicely to the demands of the pace target, so you should know if you have lots in reserve. The purpose of the session, after all, is to give confidence that you had enough in reserve to be able to achieve the next session in the ladder. So I need enough confidence from the 500m reps this week to go into the 600m reps next week, then the 750s the week after and so on until I reach a straight 5k. It is a long time since I had done this session, so I wasn’t at all confident that the 1:41.9 pace target would be a walk in the park. So I needed to follow my own guidance and stick to the target past half way (so 8 reps) at a comfortable 5k rate (29-30spm for me) and then assess from there. The other aspect that put doubts in my mind was major jetlag having just arrived home from Seattle yesterday afternoon – that 8 hour time difference takes a while to get over! Back to my familiar garage training area and into the session, I was pleased with how much I found in reserve in the second half of the session. It has been a little over 2 months since my last blog update. As I said in the last entry at the end of January my time has been dominated by work travel over the past couple of months. Australia and South Africa ticked off two new continents I had never visited before, but each trip had a busy work schedule that didn’t allow time for training whilst away. The odd week break isn’t a huge deal, I get more affected by the travel and time changes, and this requires some time for recovery. I’m now on a week’s R&R in Seattle, which doubles as a bit of a training camp. Having just arrived back home from South Africa 4 days before flying here it has been a push to get back into reasonable training form. The “good thing” about jetlag, especially when you’re 8 hours behind your own time zone, is that you end up getting up really early. This gives a good opportunity to get your training done first thing in the morning. I’m not a big fan of training straight out of bed, but it is effective time management in this situation. It just gets progressively harder as your body adapts to the time change. 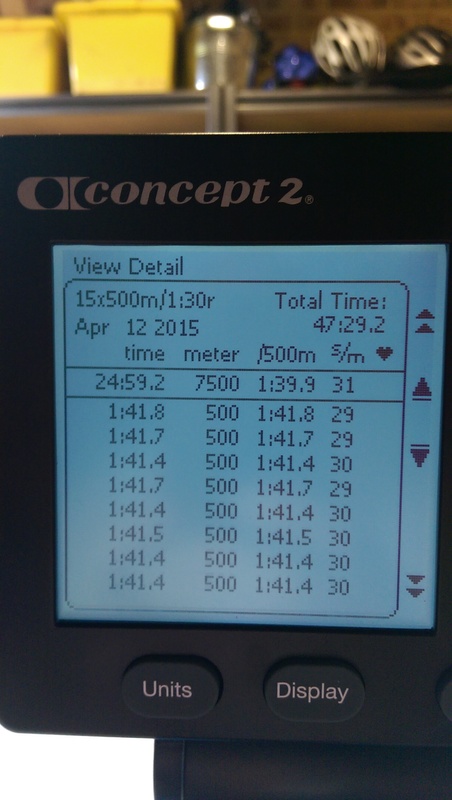 I started off with a couple of fairly comfortable 10km rows on days 1 and 2. Then a couple of interval sessions on days 3 and 4, before a schedule enforced rest day yesterday. Onto a harder 30min piece this morning as a good intensity all the way. A couple more training days here before heading back home at the end of the week, then just 4 days at home before the next work trip!